Kirsty Stansfield est plasticienne. Ses sculptures et installations sonores interactives crÃ©ent des situations et objets dans lesquels le son fonctionne en tant que mÃ©diateur dans la relations humaines et dans la relation entre l’humain et l’espace. Ces situations crÃ©ent l’opportunitÃ© de dialogues entre l’artiste et le public. Kirsty a collaborÃ© avec des artistes de diffÃ©rentes disciplines, e.a. Des dÃ©veloppeurs de logiciels, chorÃ©graphes, danseurs, musiciens, comÃ©diens, un metteur en scÃ¨ne et un spÃ©cialiste de voix. Kirsty a obtenu un PhD by Practice sous le titre “Practice Scores: a toolkit for artistic research” Ã l’University of Dundee, Ecosse. Ses formations prÃ©cÃ©dentes: BA (Hons) en Sculpture Ã la Glasgow School of Art (1993) MSc en Electronic Imaging Ã la Duncan of Jordanstone College of Art & Design (2000). Exhibitions & rÃ©alisations rÃ©centes: exhibition solo au Project Room, Tramway, Glasgow; in-situ performance Ã Glasgow’s East End; in-situ installation Ã la Wolfson Medical School, University of Glasgow; Triskel Arts, Cork; Heyri, South Korea; NOW Performance Festival; VIVID, et Sonic Arts Network. Elle a collaborÃ© avec Colette Sadler; Speckled Computing Research Group, University of Edinburgh; Smart-its Computing, University of Lancaster; Dept of Applied Computing, University of Dundee; et Stills Gallery avec Learning & Teaching Scotland. En 2008, Ã la demande de Constant, Kirsty a menÃ© l’atelier Object Score Notation pour les Ã©tudiants APT (Advanced Performance Training) Ã Anvers. L’atelier a abouti Ã une performance Ã Les Bains:Connective fin janvier 2008. Depuis lors, Kirsty Stansfield fait partie du rÃ©seau de Constant. 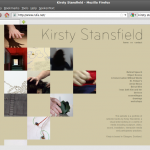 Kirsty Stansfieldâ€™s interactive sound installations and sculptures provide situations and props in which sound mediates peoplesâ€™ relationships to each other and to their physical environment. These situations create opportunities for dialogue between the artist and an â€œaudienceâ€.Â She has worked with a broad range of practitioners from different fields, including computer-programmers, a choreographer, dancers, musicians, actors, a theatre director and voice coach. Several recent projects have been developed in situations of health care where she has worked with elderly women living in a continuing care ward and a choreographer; actors in a Communication Suite at The Medical School, Glasgow University exploring non-verbal communication to enact authentic experience; and parents and medical staff in a Neonatal Unit working collaboratively with artist Steven Anderson to explore the everyday performative practices of the institutional environment in order to broaden perceptions. Her practice is research driven and based in the development of participatory processes. 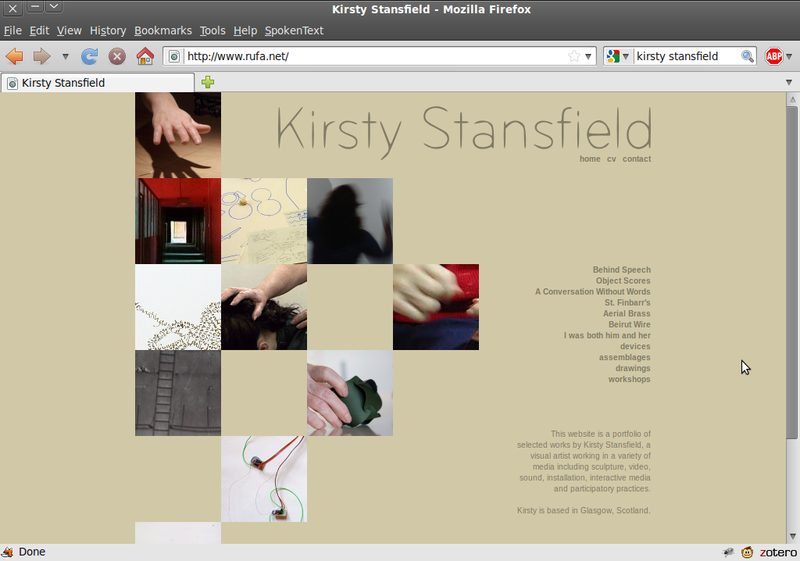 Kirsty has a PhD by Practice entitled: “Practice Scores: a toolkit for artistic research” from the University of Dundee, Scotland. Completing a BA (Hons) in Sculpture from Glasgow School of Art (1993) and an MSc in Electronic Imaging at Duncan of Jordanstone College of Art & Design (2000), Kirsty developed work as Scottish Arts Council Partners artist-in-residence with Art in Hospital culminating with a solo exhibition at the Project Room, Tramway, Glasgow. Recent exhibitions, commissions and residencies include: site-specific one-to-one performance in an unused flat in Glasgow’s East End; site-specific installation at the Wolfson Medical School, University of Glasgow; Triskel Arts, Cork; Heyri, South Korea; NOW Performance Festival; VIVID, and Sonic Arts Network. She has collaborated with choreographer, Colette Sadler; Speckled Computing Research Group, University of Edinburgh; Smart-its Computing, University of Lancaster; Dept of Applied Computing, University of Dundee; and Stills Gallery with Learning & Teaching Scotland. Kirsty Stansfieldâ€™s interactieve geluidsinstallaties en sculpturen creÃ«ren situaties en objecten waarin geluid als mediator optreedt in de relaties tussen mensen onderling en tussen mensen en de ruimte. Deze situaties scheppen gelegenheden voor dialoog tussen de kunstenaar en het ‘publiek’. Kirsty werkte samen met kunstenaars uit verschillende disciplines, o.a. computer-programmeurs, choreografen, dansers, muzikanten, acteurs, een regisseur en een stemmenspecialist. Kirsty behaalde een PhD by Practice met de titel “Practice Scores: a toolkit for artistic research” aan de University of Dundee, Schotland. Eerdere opleidingen zijn: BA (Hons) in Beeldhouwkunst aan de Glasgow School of Art (1993) en een MSc in Electronic Imaging aan de Duncan of Jordanstone College of Art & Design (2000). Recente tentoonstellingen, opdrachten en residenties zijn: solo-tentoonstelling in Project Room, Tramway, Glasgow; in-situ Ã©Ã©n-op-Ã©Ã©n performance in een leegstaande flat in Glasgow’s East End; in-situ installatie aan de Wolfson Medical School, University of Glasgow; Triskel Arts, Cork; Heyri, South Korea; NOW Performance Festival; VIVID, en Sonic Arts Network. Ze werkte samen met choreografe Colette Sadler; Speckled Computing Research Group, University of Edinburgh; Smart-its Computing, University of Lancaster; Dept of Applied Computing, University of Dundee; en Stills Gallery met Learning & Teaching Scotland. In 2008 leidde Kirsty de workshop Object Score Notation voor de studenten van APT (Advanced Performance Training) in Antwerpen. De workshop werd afgesloten met een performance in Les Bains:Connective eind januari 2008. Sindsdien maakt Kirsty Stansfield deel uit van het netwerk van Constant. Ze trad op als mediator in het creatieproces van Kaleidoscope en doet actief onderzoek naar de relatie tussen voorwerpen, geluid en spelers in !Co LAPse KoDe.